First and foremost you have to come to terms with your interests, tendencies and habits. Once you’ve done this its much easier to prepare and you’ll have fewer missed opportunities or uncomfortable moments. If you can set the right things aside beforehand then your more spontaneous photo opportunities will likely to be as successful as your more thought out photo shoots. One of the first things photographers quickly become accustomed to doing is having a bag or case containing all their gear and quickly checking to see that everything is in it before running off to their photo shoot. This is likely what most people associate with preparation, but there is quite a bit more that you should do. Although this may sound a little much, perhaps its because I’m in San Francisco where the weather can be unpredictable, I have my car stocked with spare clothing including jackets, sweatshirts, hats, gloves and on some occasions shoes. These days I even keep a pair of rain paints in the car as well due to an experience where I had to drive home pantsless. Sometimes photography can be a dirty job as was my experience photographing Mavericks on a muddy cliff just after a fresh rain taught me. As you’d imagine I drove home very conservatively so as to avoid getting in a situation where I’d have to explain my pantsless driving to a police officer. Other things I’ll keep in my car include a petzel (headlamp) or flashlight for dusk or late night photo shoots, a GPS unit, water, spare sunglasses, umbrella, cushion, pen, paper and business cards. Being prepared in many regards is about thought to the elements, survival, creature comforts, networking opportunities, and of course your gear. In many regards having a generically packed photo bag is fine, but before heading out I think of every outing or trip as it’s own unique excursion. I try to avoid a standard run through of my gear to double check I have everything. The standard run through is a very easy way of becoming complacent with what you are heading out with and leads to missed opportunities. By thinking of every trip as a completely new and unique outing you force yourself to discover the absence of those 1 or 2 items that can make the difference between a successful and unsuccessful photo shoot. What you’ll discover with this approach is what your mainstay pieces of equipment are, but you’ll also soon learn what specialty items you need for specific subjects or styles of photography. This is important information to become aware of and learn. Once you’ve become aware of what core and specialty items you use, you can then assess what items you might want to bring duplicates of. Not everyone can afford to have spares for everything. The more privileged can afford to bring a spare camera bodies while others may just need to have a spare lens cloth. For myself I discovered on a recent trip to Yosemite that a cable release is pretty critical to my style of photography. After losing my cable release I quickly discovered that my backup release was not compatible with my newer camera body. It was a disappointment at the time and something I’ve since learn from. I now have two identical cable releases just in case. Other items to consider carrying more than one of include compact flash cards, batteries and lens caps. Sometimes spares are good to have, but not always convenient to have with you all the time as is the case with a tripod. When I upgrade equipment I’m not always super quick to get rid of my old items (much to the chagrin of my wife). I can’t always do this, but when I can get away with it I will. As for my spare tripod… I usually just keep it in my trunk. One of the most important things I’ve since learned to keep on hand in my camera bag are tools. Tools for adjusting or fixing my tripod and lens mounts. At the moment that amounts to an Allen wrench and mini-Leatherman. To minimize the weight impact of carrying these tools I’ve found the smallest versions of these tools available. Clearly when out in the field the last thing you want to have to focus on is any lingering thoughts about missing supplies or gear. If you’ve planned and prepared well you’ll free your mind to focus completely on your subject. This is a tough thing to achieve, but when you do you’ll find it is a liberating feeling. Awareness to Environmental Factors – When is sunrise/sunset? When is moonrise/moonset? When is low/high tide? What are the forecasted weather conditions? Knowing these things will allow you to plan accordingly not just to capture your photo, but possibly to survive your trip. Buddy Up – For more extreme outings be sure to head out with a friend. Not only will they provide good conversation, but they’ll be there to watch your back whether you’re in bear country or photographing traffic from an island in the road. Notify Others of Your Plans – If you’re heading out on a day trip or going into wilderness always let someone know where you’re going and what your itinerary is even if traveling with a buddy. Let your friends, spouse or park rangers know where you’ll be and when to expect you back. If anything does go wrong you’ll have a greater chance of being found. Use Your Senses – Don’t get tunnel vision. Embrace your peripheral vision and hearing to notice things around you. When shooting wildlife this might just save you from prowling predators and when shooting wildlife or travel subjects it might just help you find new and more interesting subjects. Timing & Location – Are you going to be in an area that becomes less safe after a certain time? What are public transportation schedules? Do you have an up to date map? Polarization – Do you shoot with a circular polarizer? If so then wear polarized sunglasses to see what things look like polarized. 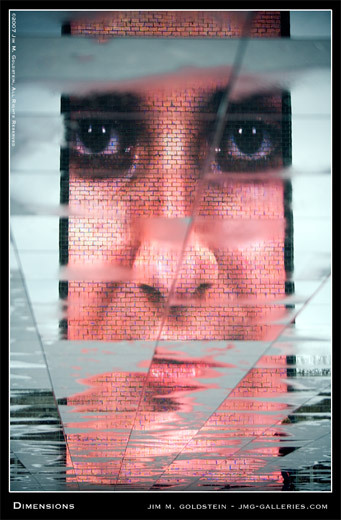 You might just see clouds and reflections differently. Ready at a Moments Notice – Is your camera on? Do you have the right lens on? Is your camera in hand or on a tripod? Do you have the right camera settings preset? For a lot of subjects particularly wildlife, street and event photography moments are fleeting. If you’re not walking around prepared you’ll likely miss great photographic opportunities. 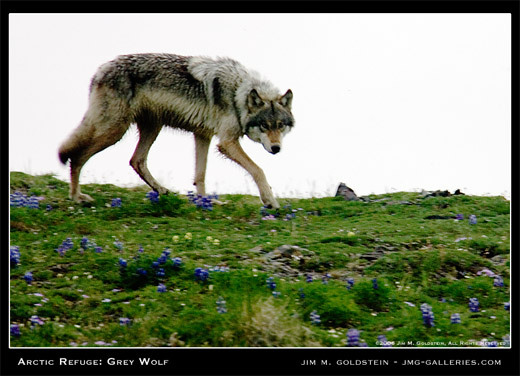 In order to capture this rare encounter with a Grey Wolf in the Arctic National Wildlife Refuge I kept my eyes and ears open. Equally important I had my camera on, pre-set with the right exposure mode & ISO setting, mounted on a tripod and with the proper lens attached. I had no more than 10-15 seconds to capture this moment so being prepared was critical. 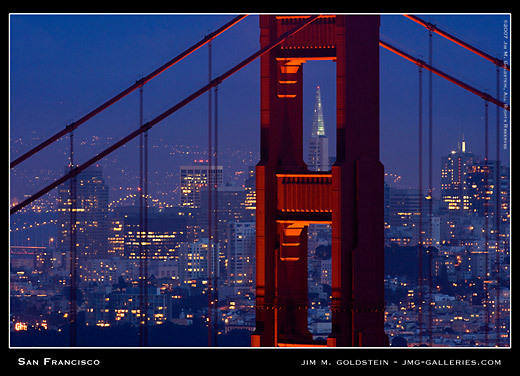 To capture the San Francisco cityscape under clear conditions it was essential to monitor weather conditions through out the day and know when the sun would be setting. In the San Francisco area the weather is seldom stable so when winds pick up you have to be prepared. With extra jackets and the impromptu use of a car sunshade I was able to keep warm and shield my camera from vibration. Sometimes jackets come in handy for other uses. Although not particularly cold on this day in the Skagit Valley of Washington state it was important to know your subject and their behavioral tendencies. 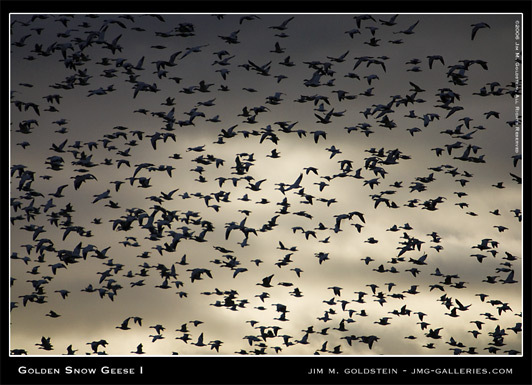 Photographing tens of thousands of Snow Geese generates the risk of being defecated on as they fly overhead. Wearing a jacket with a hood proved to be a good precaution to take. Fortunately even though I was below a massive flock of geese numerous times I seemed to avoid being hit. My rental car on the other hand did not have the same luck. 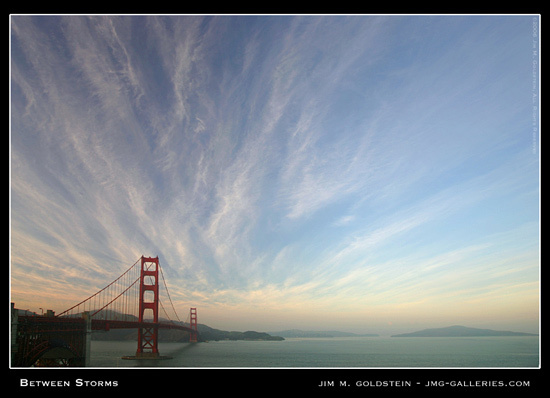 When photographing “Between Storms” I looked out at this beautiful scene of the Golden Gate Bridge under a sky that seemed devoid of many clouds. Only when I put on my polarized sunglasses as I walked around did I notice a hint of a radiating pattern of high altitude clouds. Putting my circular polarizer on my lens and adjusting it revealed this great component of the scene. 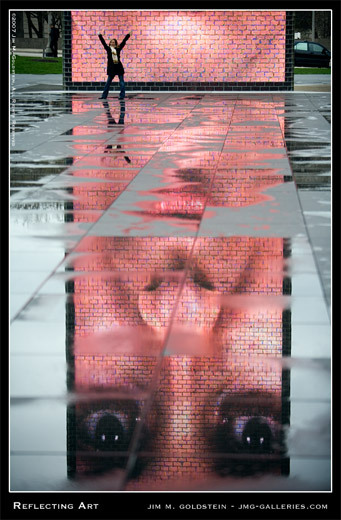 At first as I walked around Millennium Park I was instantly attracted to Crown Fountain’s reflecting facial projections in the puddles on the pavement (see Dimensions below). This photo was exactly what I was after as I surveyed the area. Out of the corner of my eye I noticed other people stepping into the scene. I carefully timed my exposures to minimize interference, but on one occasion a tourist struck a great pose and I quickly adjusted my composition to include them. My awareness to my surroundings helped me capture a photo I’d likely never have visualized beforehand. Nothing is more unpredictable than small children. 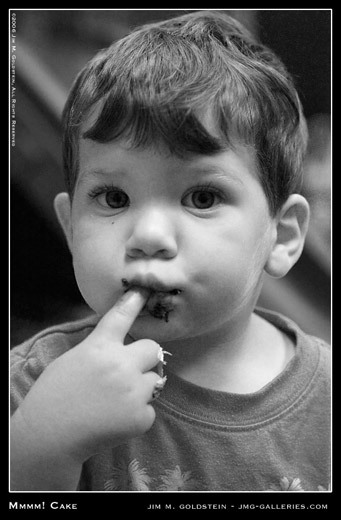 While photographing my niece’s birthday I of course photographed the stereotypical blowing out the candles photo, but it was in the brief moments afterward that revealed the magical moment of my nephew striking an unpredictable pose after sucking down his slice of cake. Presetting my camera for the action and keeping my eyes open to the events unfolding around me helped me get this photo. Thanks Ron. I appreciate the comment and am flattered you read the article. Jim, This is a great article. The kind I'll bookmark. All those years in the Boy Scouts should help me to be prepared. Resources like this make it easy. Ready at a moments notice: What I do a lot that is embarassing is leaving the lens cap on when I'm trying to shoot. The hypothetical benefit to looking like a hack is that nobody will pester you with camera questions. To save face I guess I'll say that I intentionally leave the lens cap on. :-) btw, what is a car shade? I'll have to learn that one, I could have used it at Marin. Richard... a car shade... the windshield do-dad that you put up to keep your dashboard from fading and to keep your steering wheel cool when you leave it parked in the sun. They usually fold or roll up. If I had an umbrella I'd have used that instead to shield the camera/tripod from the wind. Probably the first photography article I have read on being prepared against being pantless. Great tips Jim!